The digital marketing world is changing. 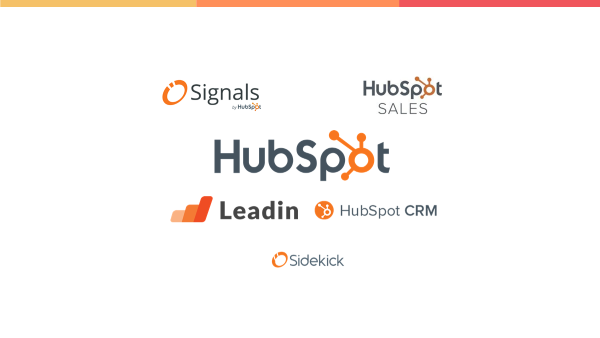 What will happen to HubSpot? 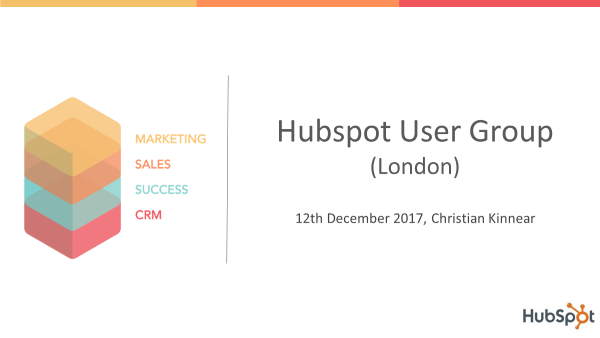 This is the transcript of a talk given by Christian Kinnear, Managing Director for the EMEA division of HubSpot based in the Dublin office. 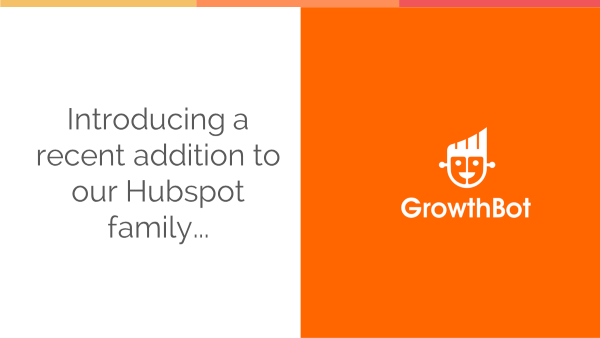 The talk was given at the HubSpot User Group meeting in December 2017. The talk was organised by Whitehat a HubSpot Platinum partner and a leading marketing agency in London. Download a summary of this talk as a free pdf here. Thanks very much indeed. Thank you Clwyd. Good morning everyone. How are you all today? Good. Good. Very excited to be here and thank you all for inviting me. 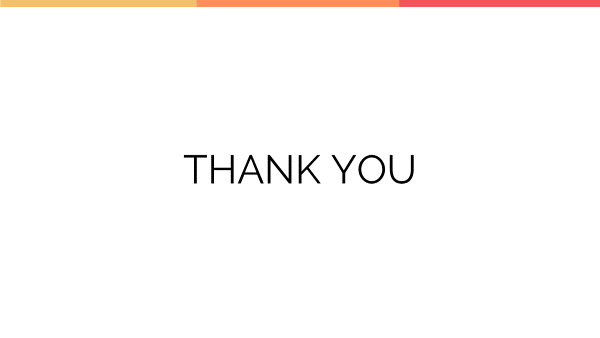 Thank you Clwyd and the team at Whitehat Inbound and for all of you to give me the opportunity to speak in front of you. 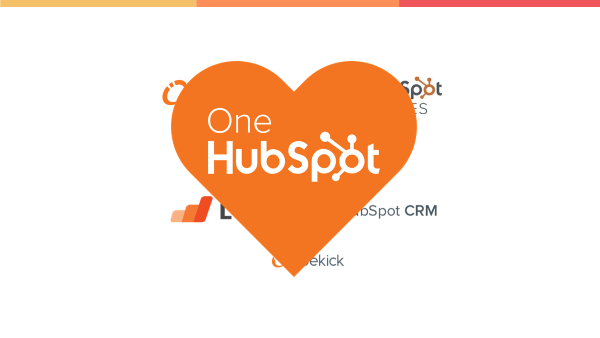 I think for today I want to talk a little bit about some things that are happening in the industry, things that are happening more generally, how that relates internally to HubSpot, from a product set and to try connecting some of those dots together as to how we're thinking. I'm not going to dive into micro detail. I won't be digging into product feature functionality topics. It's not something I want to try and cover today but just give you a high sense of where we're going and why we're going there. Some things that are interesting and how we're thinking at the moment. Before I dive into my presentation, Clwyd touched on this: I've flown in from Dublin our headquarters for EMEA, for Europe Middle East Africa area. We've grown and expanded that team. We initially started the business over there in 2013. We had an initial goal of about 75 people to build that office. The first one outside the US was set up in Dublin. We thought that would be an interesting way to set up a Sales marketing hub from Dublin, no pun intended. The goal then expands to 150-300, we're now at 420. We'll probably go somewhere seriously north of that and we've been growing expanding ever since. We've got lots of things happening out of Dublin. We've a very big robust product engineering piece, so we were very proud. We're building core products out of Dublin and going to touch on one of those during the presentation. Servicing Europe primarily, Middle East Africa is our emerging markets, but it's important to think our company does appreciate that to service Europe, need to be inside Europe and understand some of the nuances and hence. My role and some of the focus is to make sure that we listen to you. I think to start with this. This is a little bit where we're going. There is for sure a massive shift that you've all seen and felt. You're seeing all the time, how we interact with technology. There are much more voice interactive technologies in the market, So, given this is our new reality and people are interacting this way. The obvious extension is people are no longer saying "I want to go on my desktop, pull up a Google search engine, fire in a couple keywords and see what their response is come back on page 1-2-3-etc., and scrolled through those and try and find which of those search answers is the most relevant one to me". "People now want THE answer." I want to ask for an answer and I want to get that one answer back from my device, whatever it might be my assistant. So, the increasing change is: don't give me options, don't give me lists, don't give me things have to search through and mature and try and find all the things you presented which one is the right one. Just give me the one. That's increasingly demand of consumers and all the generations coming through which will absolutely be an expectation in the business world. I don't want options. I don't want to search. 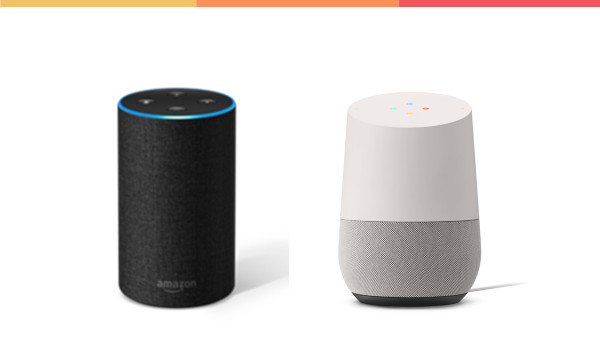 Mobile is the obvious big one: Siri, Cortana, Echo, Google Home, there’s a lot of devices now. That's change fundamentally how we interact with technology and that is not something that's coming: that's here, it's arrived. "The underpinning of how we interact with technology is changing all the rules and a lot of what we are based on." 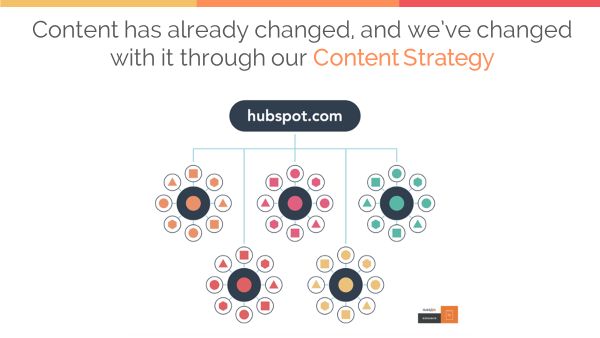 What Hubspot been doing is trying to look ahead and see what the next change shift is going to be. There's disruption in market and how we can try and get ahead and understand how that might affect in advance. So, this shift of technology is changing a lot of things on the consumer world and as with many things again. The consumer signal we see ahead tends to impact the business world very significantly and we're seeing that too. By extension to something interesting that is not here yet, and will be here quite yet for some time, we think of people saying it's more natural now to not have those 10 Google search options and trying to figure which one. The same logic applies to websites. So, if somebody comes to your website why wouldn't a feature would they scroll to all your content, looks all the pages, try to search and find a look through to find what they want. Future web sites might be an assistant, an assistant sitting in the front of your web site saying " Thanks for coming to our site. What can I do for you? How can I help? What are you looking for? What's the answer you're looking for?". So, there's a lot of big things coming, and this is stuff that's coming down the track. We're thinking ahead of how we start to think of that world where content is not presented and sorted and sifted through. One of the extensions of all this is that: if keywords and how people search is changing, which it already has, there's a lot of work happening in the background. So, Google is still the de facto standard we all look to in terms of search and content, the lot of changes Google has brought in since 2013 in background and really starting to surface now. They have the "Hummingbird" algorithm brought in “Rankbrain”, some of the new AI, and AI is very much taking off from algorithms. "The old algorithm of "if this is true, give me the answer" is being phased out." The AI of understand the intent is the big thing. You'll see this every day. People don't now search for “Restaurants Islington”, you don't type that in. People are now having conversational type searches like "Where's a great restaurant nearby". So, Google needs trying to understand that the words you're using aren't keywords that necessarily connect with your search. You have to understand those combination words usually mean you're trying to ask something else, it's connecting topics. A lot of what's happening now is this sense of topic clusters. There is within Google and this is a pretty simple representation of it. And Google is now saying when you're asking about something it's no longer about the word, if the word exist on your site, on your page or in your content, but it's actually “what's” the topic you're generally trying to talk about and “who” knows most about that topic. 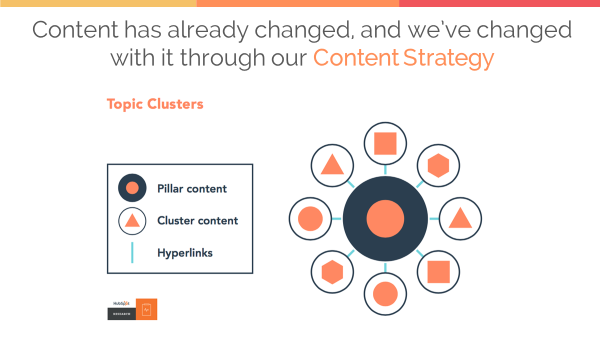 So, this concept of having a topic cluster with a pillar content page, which contains all the relevant information around that topic, and clustering things around it. If you have a gym, a fitness gym, maybe you do a certain kind of work, for example weightlifting course, but probably a lot of other things around weightlifting, about health, diet, fitness, etc., they're all clustered content that might be relevant to that topic. So those clusters that sit around this is no discussion topic area. I need to build at these because this is now how people are searching and this is how search engines are now working. This is actually live. Now people may say, well I don't know what topics are relevant, if you go on Google Search today and you can maybe do this during the break, you go and search for a term, you'll see all these associated topics come up now below the search, they'll say "All topics related to this search". So, whatever your business is, if you're a beauty salon, plumbers, builders, whatever your company is, you search for that today. You'll see all those associated topics and those are things Google is suggesting to saying "these are things you should have on your site. You should have these kinds of topics to be clustered around your content as well”. Because we're going to start to direct people to your site. If they're looking for these things with the intent of trying to find you they're trying to help you figure that stuff out today. Well, it gets a little bit complicated. We have lots of pillar topics, pillar content pieces. 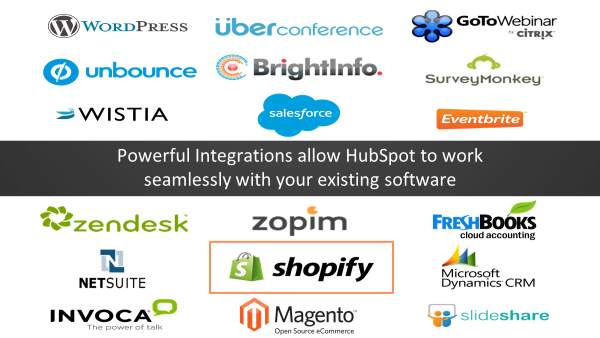 HubSpot is a complex company and most companies are a little bit complex. Maybe in our world something around Inbound marketing, around CRM, around HubSpot Academy and so on, we could have big pillar topics that we think are large complex units each of which has a cluster of content around it. So, this starts to feel that there's quite a bit of work you need to do if you're going to build up your business and change how Google looks at your company, looks at your business, your online footprint, because is no longer looking for which of those words are contained on various pages of your site. So this is suddenly feeling like a different challenge. And again, this is happening right now, is how Google searches and how it ranks today for your site. So this change has already come into effect. 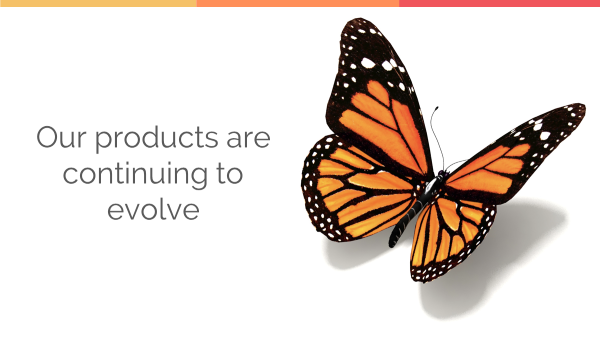 The good news is: we have HubSpot content strategy is baked into all products. So, if you're a paid customer of basic or enterprise products, this is contained already inside your product. If you're not using it, my call to action is "Please go look at it", take some time, do a little bit of research with a bunch of content online to help you understand, a lot of free Academy information about how to get your head around how this works. And it's very simply a tool that lies to figure out the pillar page that you're building all the associated clustered content and had a hyperlink to set it up and try and get all your content rearranged in the right order for it to satisfy Google. And, again, is how people are searching and increasingly as be the shift continues towards voice search and conversational search this is going to be an increasing thing to get ahead of. The piece that we've looked at our side. I should disclaim, this is illustrated only, I'm not actually sharing our data results. But what we have seen is, internally, we started doing this several months ago and we pulled a bunch of our existing posts began to cluster around topics I've just described internally. We've tested this ourselves, we've used it over the last year and on all the posts that we had, we clustered. 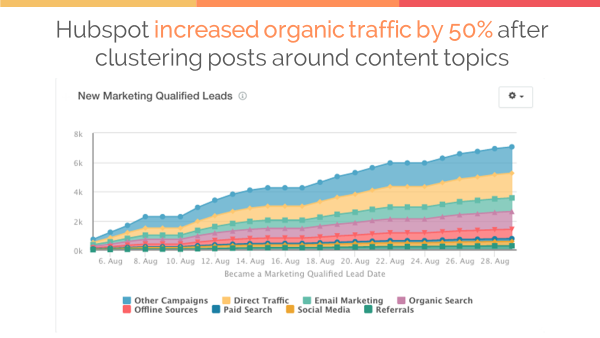 We've seen a 50% jump in organic traffic to those posts, since we've clustered and since Google's brought in the change. So, it's driving significant results. We've done a bunch of tests with customers as well, “People in Beta” who tried this for us. 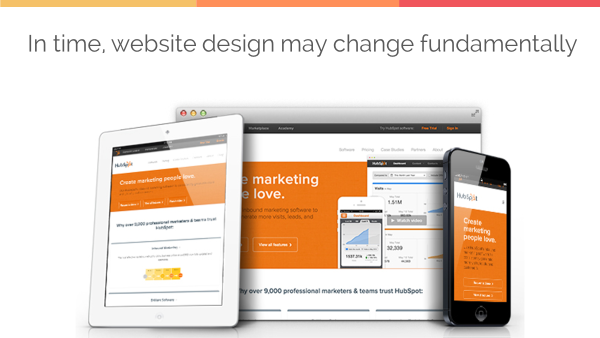 We've all seen similar jumps in traffic being driven to site based off these new changes. So that there's an element of first mover advantage or early mover advantage. B) Aren't doing anything about it. So again, an interesting call to action is: this is live, it's happened, it's already in place and has been for some time. Great. Something else. "The bots are coming" and, as I looked that last night, I probably should say "The bots are here" and maybe to reinforce the same point. People sometimes have this image when you think of bots like a virtual version of this robot army that's coming to invade and take over and has evil intent at heart. There are many good bots and I'm going to focus on the good bots. In our world we've got a number of things happening. 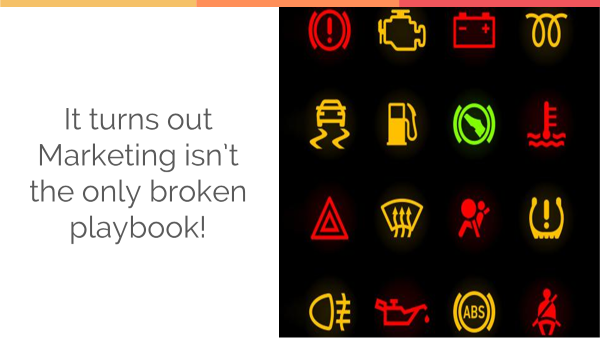 You're exposed to these in the consumer world a lot. Today, there are shop bots, crawler bots, lots of things that work today for finding the best price for hotels holidays. Lots of things that you probably aren't fully aware, or even that was happening, but those bots are doing lots of good things in background for you, going and searching based on some rules and algorithms they have, as to how you should go and service the response that's being asked on the website. In our world we have a new addition to our family. It's called "GrowthBot", it's our newest child. 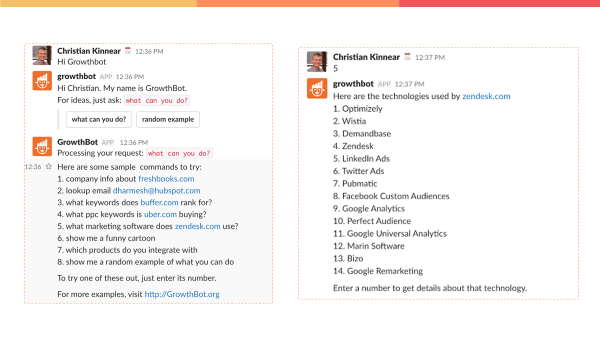 GrowthBot is a combination of a no-bot, where it's loaded with a lot of information that we think is relevant to our industry or questions information might be asked. That's a lot of the internal information we have and a lot of content and resurfaced to GrowthBot as a crawler bot too. It will do all this in a chat functionality. This is an app that works inside "Slack". "You can ask it a bunch of questions, then he'll go and get answers for you." In my example, you can ask a bunch of questions and he'll give you suggestions as well. It offered me a bunch of things to say. “What keywords does this company rank for?”, “What are the PPC for this company?”, “Show me a cartoon”, “Give me some information about this company”, “What software does companies use?”. A lot of things. This is just relevant to me and what I was looking for and for illustration I threw in. Let me pick this one which is "what marketing software does Zendesk.com use?" and it gives me the 14 pieces of software that Zendesk are using. There's lots of applications here. This is a "All looking available information", but stuff that's kind of difficult sometimes for you to do yourself. I can be something where this took one minute. So, if you think of the application of contacting somebody saying "I've got a bunch of questions about your company, they're a little bit complex and often the individual will take quite some time to gather that information for you”. Surface get it back to you. "This stuff is 24/7. Bots are available online all the time." Clwyd had a really interesting comment on it and we were talking about bots, there's an element of how you might leverage bots for progressive profiling. There's an interesting conversation element to arriving to a site and having a chat messenger chat with the boss. "How are you? What's your name? Where are you from? What do you do? What's your job? What your company is". It feels like you're interacting with some conversation. You collected five pieces of interesting data and as that conversation goes you could potentially be capturing more. Which doesn't feel like heavy duty form filling but it's more of a conversation piece and the bot is completing your profile in the background. So it's interesting stuff. As well as it's got a small sense of humor. This funny cartoon whom piqued my interest and said "oh god, now I have to take a look" so share with you to show that bots and marketers can have a sense of humor. 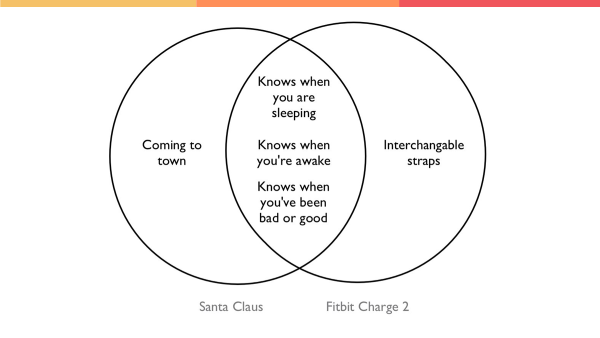 It shows me a Venn diagram between Santa Claus and the FitBit Charge, to which I'm wearing one today, and says the areas that are not common is Santa Claus is "Coming to town", Fitbit charge has "Interchangeable straps", but both "Know when you're sleeping, know when you're awake and know when you've been bad or good". That was kind of funny for the holiday season. So, bots have a lot of application. One of the things around bots is the concept and the trend of messaging in the business context. You have seen this, if anyone has either for yourself or younger friends, cousins, relatives, etc., less and less calling and more messaging is the order of the day. And that's happening all the time and that will continue to happen. Where we're seeing the phone interaction drop off a cliff and messaging, and all those forms, is just jumping through the roof, even emailing is no longer a conversation tool. Messaging is the future, and no better interface than a chat-bot if it's a messaging piece of text interaction for bots to understand interpret text, with that AI behind it, deep neural network of understanding the intent when you ask those words “I think you mean this”, here's the answer and Bots will learn as they continue to use this. "The future of having bots and having that constant bot simmer in our work environments is not, again, just coming, it's already here." 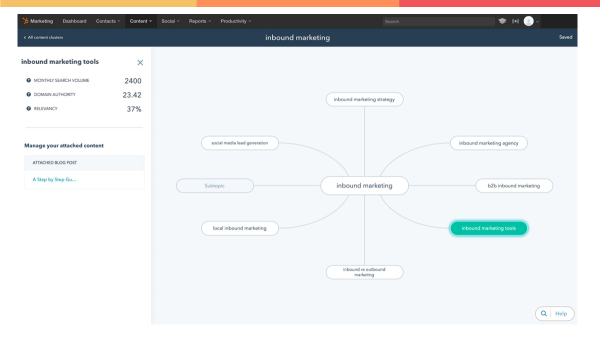 Within HubSpot, but specifically back into maybe the core products, I thought would be worthwhile sharing a little of how we're thinking from a product set and how the future of our product is evolving as well. And this was our world as has been over the last number of years. We, as a pretty agile company, have tended to develop and launch product and then iterate and understand how we need to develop the product based on feedback, from user groups like this, a Beta groups, beta testing groups, and our business partners. We had a lot of different products in the last years and core HubSpot marketing, at the center, we had HubSpot Signals, Leadin, CRM, Sidekick, Sales, a lot of different products that are did should have us do what any of those do and have them work together, and in some ways we were building these a little bit in silos, they were all natively built inside companies. We've built these out ourselves. But it was becoming a little bit dispersed a little bit fragmented in terms of how these pieces might work together. And we've this year taken a directional shift which I think is a really good thing. 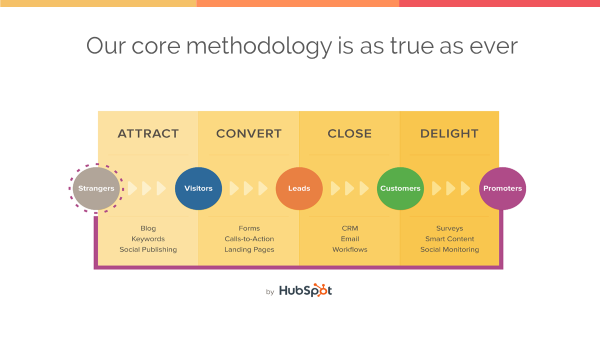 We have what's called "One Hubspot", it's an internal rally cry. Let's simplify between product brands all the things that we're doing and where we are starting to go in slightly different directions, that bring all under one umbrella, and get to share that with you today, as to how we're thinking about that. 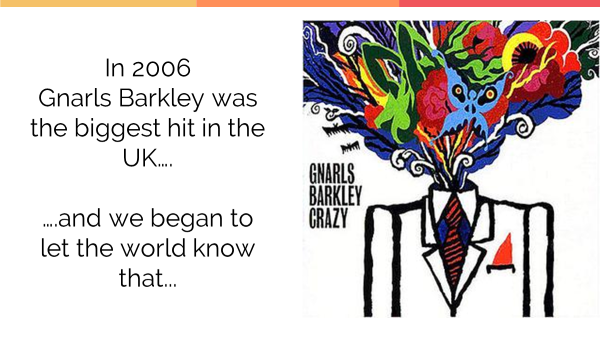 About 11 years ago, 2006, when Hubspot was started, Gnarls Barkley, if I remember is "Crazy”, was big hit in the UK in 2006 and was 11 years ago. Feeling old, that was that long ago. 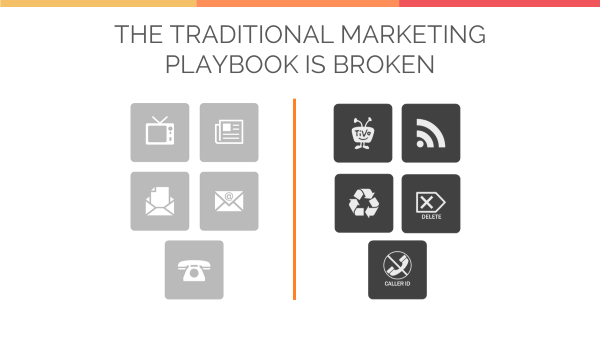 "The old marketing playbook is broken." That was true and to me ways is still true today. Maybe this is Gnarls view of what was crazy, but that the wave we were working was broken. And that's actually still true, but it's true in the broader sense. So, we have the old front office concept of anywhere there's an interaction with your customers. There's a bunch of elements that are broken in that front office interaction, not just the marketing piece, and level of the journey we've taken is when we started focusing on that marketing funnel, understanding how do you change that interaction with prospects, because they've already changed how do we adapt to the way people want to buy and then uncovered a few of the things further down the funnel in the Sales and then the customer service part of the business. So, we still have this and this is again still true, but honestly the journey we've taken, this vision that we always had of finding these stranger to visitors leads and bring them through to becoming customers and delighting them, was mostly a vision aspiration rather than a reality at the beginning, because we were building from left to right to solve the marketing challenge that was over, here trying to fix the marketing broken playbook, right through into selling and then managing customers. The great moment that we had, so we launched our sales products two years ago, and just in the inbound conference, that Clwyd is talking about this year just gone, we announced a customer success product. 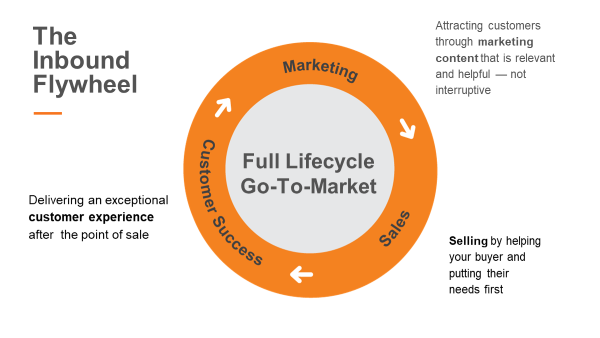 So we now have, from left to right, all the way through the marketing product, the Sales product and the customer products, underpinned by our CRM. 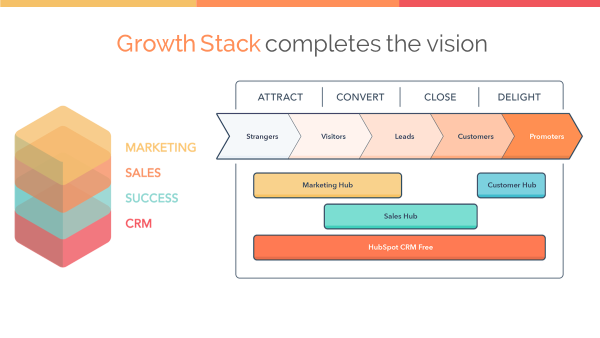 "For the first time ever we've got the full journey and that entire journey is now mapped within HubSpot environment"
Which we've never had before creating the stack concept that we have to the different parts that fit together. And finally, they can come through to be managed in a way through the “Customer Success” products, which will drive NPS, will drive the right interactions, the way they want to interact and there's a significant play for bots in this space where people say I want a fast answer, I want THE answer, I wanted it now, I want it 24/7 and that's the primarily thing will keep me happy. There's an obvious correlation using bots in this space over here, but happy satisfied customers generates more brand, more referral, generates better business for you and it starts to affect your position in market, which helps with your marketing, which helps your Sales, and this flywheel starts to gain momentum. Each of these parts feeds the other if we get these three pieces in sync. We've not been able to offer that to this point, but we are now given what we have now, the success product as part of our portfolio. Aside of that, there's a bunch of other things we don't do and things we won't do, and lot of great companies out there, who's very much specialized in certain areas and certain fields and, for your reason and for good reason, people prefer to keep that ecosystem of complementary products, and you like deep specialization in certain products and things either it's just some that's used and is embedded in your business, that's great. Although do you feel there's a bit more functional specialization in those products, also fantastic. So, how we integrate these into our ecosystem is really important. I've highlighted Shopify just because it's a new announcement we have. We have an e-commerce bridge. We've just announced its native integration with Shopify and, again, trying to look ahead that all companies are effectively becoming e-com to some degree. There's a lot of e-commerce interaction happening online. Having something like Shopify integrate to our product natively with a lot of API integration is a requirement. We're trying to get ahead of that too. That's the biggest one is the fuel that we're looking at as well. But all of these form part of our ecosystem to fill out the last part of our vision which is this connect program, this is the integration piece down here. And I like this image just purely because it shows the different components that we now have to complete the picture. But there's a reason why this is an oversized CRM component in the middle. This CRM piece at the heart. The final thought to leave with is that concept of CRM is connecting back to consumer and business. Have those two parts married together. 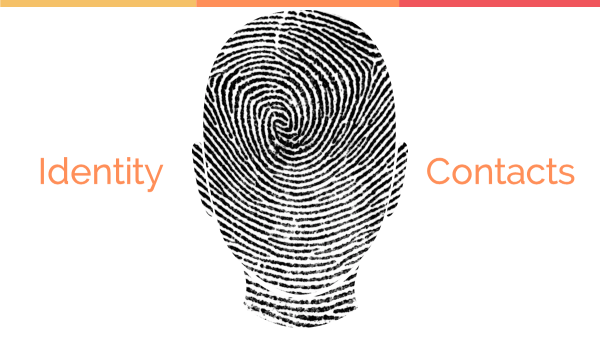 We are all fully aware that in your consumer life and your consumer world, your sense of identity online is something that many companies are interested in. Amazon, Facebook and Google are all very interesting in understanding your profile, who you are or what you're all about, your preferences, your biases, your buying preferences, your relationships. They like to understand all of those things about you. And generationally, certain generations will have a sense of not being super comfortable having all that information known about me. "The next generation is coming through are not only accepting of it, they actually expected." So think again of how these generations of consumers are coming through. They are totally fine that I assume when I go online everything I share is out there, it's the price to pay to get connected. The expectation for things like Google Now where you walked in a street on Google now will represent and say "Hey Christian, knowing that you're a cliched Irishman you like a pint of Guinness. There's a pub nearby which sells Guinness, something you might be interested in because that meeting you have isn't for a few more hours" or whatever. People actually want that, that's expected now that you'll get information presented to you based on. You giving information letting these various ecosystems understand and know you and that will help your experience from a consumer perspective. The real concept of the "Contact"
My experience shoots up from a business perspective having a huge database to mine of information about your target market, very valuable indeed, and that's somewhat assumed to be get that and we see this all the time in the consumer world. But the concept of the contact in the business world it's exactly the same rationale and that's coming. And again, if you think in some ways today, when we talk about contact, if you go back to your business, look at your list of contacts and what you know about them, it's probably demographic information, predominantly. It would be "who they are", as their title, their phone number, email. Probably not a ton more information you know about those folks, but as much as this is the present that's very much the future and being able to serve your customers and understand prospects customers about knowing them intimately, being able to represent the right information, tailored customized interaction. They'll expect it, never mind being okay with that. You'll need to have some strategy. How are you going to start collecting more than just those demographic or pieces of information? What are all those other sources that people have and how can you start to get a fuller picture? There's the whole collection of information to understand the path and Journey somebody takes, which is much more interesting holistic view of that context. 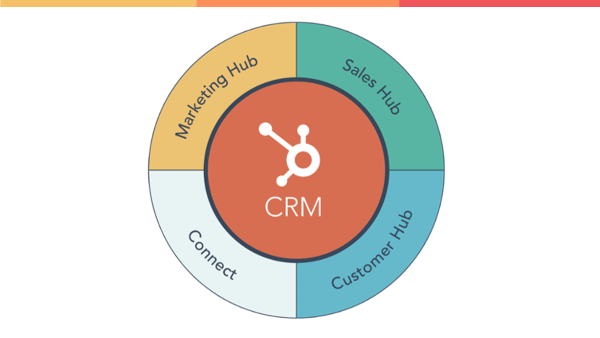 "Contacts are key hence the CRM is the piece we see as the centre of everything." Also from a pure business perspective in terms of how you operationalize your company. I've lived in the world where we had different products, to market products to CRM product, a customer product. They are good they don't fully interact well, they don't synchronise properly we get difference of opinion of data. We get marketing and sales, arm wrestling. You get this constant battle and friction between them as to interpretation of data and reports and views. Having one database, that sits at the centre of this, a single piece of data and same consistent reporting. It starts to remove all of those frictional points. Let's invest our energy there rather than internal fighting. So, having one centralised source from a customer perspective and from prospect, but also from an operational perspective, having CRM at the heart is important. That's it. I did want to say give a little bit of a futuristic view of sorts but how we see things are happening, some things that are coming down the track, things that are here and coming. 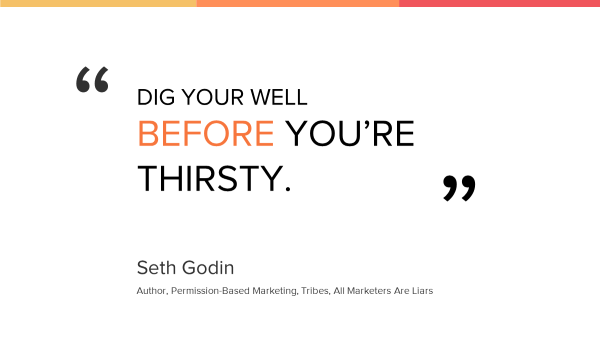 There is that first mover advantage piece I mentioned earlier leave as Seth Godin quote. Sometimes these things feel like "Oh sure okay but that's going off in the future. That's not really what we need to worry about today". I'll get to it later, but I realized quote just to connect my Guinness story. Bit well before you get thirsty it is probably an interesting way to close. We are.